So do we win the award for tackiest Christmas tree?? Probably not, but consider this my official 2013 submission. Believe it or not, that balloon was a joke gift to me from John for my birthday back in August....yes, as in 3 months ago. I can't believe that Patrick still looks so fresh and new! 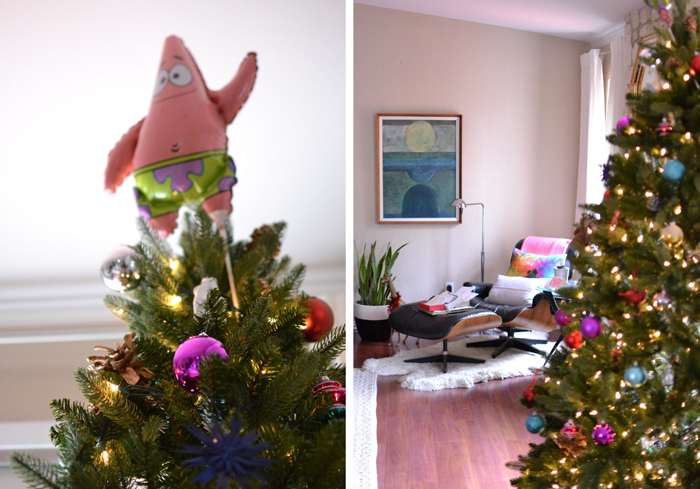 It's the balloon that just won't quit so we turned this champion of a starfish into the star for our very first Christmas tree because 1.) outfitting these twinkling (faux) firs aren't cheap and 2.) you have to admit, it's a little awesome. Paaaaaaaaaaaaaatrick! I love the pine cones. Cute! The topper is silly but really works.